Where is that Anticipation Rejection? Isn't it Obvious! Where is that Anticipation Rejection? Isn’t it Obvious! 79% of what: Note here that the data set only includes office actions that contain at least one rejection. 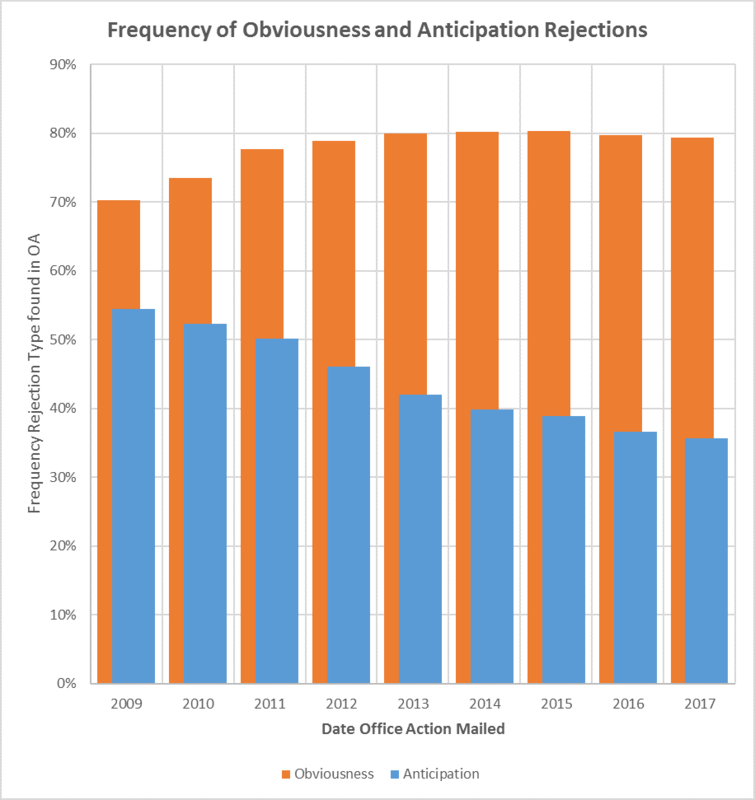 Thus, for 2017 we could say that, 79% of actions with a rejection include an obviousness rejection. A second big caveat is that the data set only includes applications that have been laid-open; and they had OCR scanning or other data problems with about 10% of the rejections and those have been excluded from the data set. I’m still chasing the difference between novelty and obviousness, using the example of a claim dated 2010 and a very old reference, say published in 1930. It seems at first sight to destroy novelty, but you have a rock solid case that (never mind the precise reason) its teaching was not enabling when A was published in 1930. What is your reply to that? The examiner’s logic sounds like impermissible hindsight to me. He takes technology that was not enabling in 1930, combines it with his 2010 knowledge (why — he has to explain that combination and not just make a conclusory assertion because he wants to make an obviousness rejection). Look at the #14 Thread. Lee De Forest’s 1906 Audion, a partial vacuum tube that added a grid electrode to the thermionic diode (Fleming valve), is a (partial) vacuum tube triode. The vacuum tube diode that is an “ancestor” of the vacuum tube triode. The vacuum tube diode and the solid-state diode were invented in the 1870s. The solid-state production techniques needed to make a transistor (a solid state triode) were patented starting in 1946 and were being researched by many in the early 1940s. Does that 1940s knowledge in combination with the vacuum tube triode of 1906 make Shockley’s solid-state triode (the transistor) obvious? Was Shockley entitled to patent? There should be no argument with respect to Shockley’s entitlement. Using simplified Kantian terminology, the Examiner is trying to argue that the new knowledge that the inventor created was not synthetic but was predictable on the basis of a combination of 1930 technology with 2010 technology. That combination does not sound like a minor near-analytic (obvious-to-try) change producing a predictable/analytic or near-analytic result but is in fact a radical modification that produces new synthetic non-obvious knowledge. Thus the Examiner argues for obviousness (novel synthetic knowledge) on the basis of his novelty (novel synthetic knowledge) that he created on the basis of hindsight from knowing the written description that he is reading. Such reasoning is completely inappropriate and non-persuasive. If the new technology were predictable, the 1930s inventor might have invented it by minor modification (obviousness), but we know he could not have because the knowledge did not exist in 1930, the 1930s inventor would have had to develop all that knowledge to which he had no access in the 1930s. The arguments that I outline above need to be made tighter (I have to do some errands), but I think you can run with them. One should be able to argue that because a PHOSITA knew in 1930 that magnets were insufficiently powerful to be enabling, there was implicit teaching away from 2010 technology. If there is not an explicit chain of references since 1930 teaching toward the 2010 technology and if the examiner can’t supply said references, he can only be using impermissible hindsight to make an obviousness rejection. MaxDrei keeps on “still chasing” by wanting to focus on the “single reference” aspect and somehow (without more) wants that single reference to be able to change (over time) what it teaches and thus permit a reference to have some type of “moving date” as to its legal effect. He keeps on asking because he does not like the (correct) answer that has been given him (again and again). His modus operandi: keep flinging his feces against the wall until something sticks. Well yes, Paul, I do understand that references relied upon as novelty attacks necessarily must be enabling, but ones relied upon for obviousness attacks not necessarily. For me, that much goes without saying. For me, the interesting things are 1) for novelty, the date on which enablement is assessed (1930 or 2010) and 2) for obviousness, how much the basic knowledge of the skilled person in year 2010 can be relied upon when assessing in 2010 what claimed subject matter a 1930-published Ref A renders obvious. Max, it sounded to me like the example being used was an old 102 reference with an inoperative magnet? An old reference, yes. Magnet, yes. But no reference teaches to resort to an “inoperative” component does it? Doc A taught, in all good faith, to do it with “a magnet”, without having any appreciation that no magnet at the time could deliver a strong enough magnetic field to do the trick. What I set out in 15.2.1 as of interest is the point. Forget the magnet example if it does not help or if it confuses. How about my 15.2.1? Do you understand either one or the other of my two interesting things? If an embodiment can be prophetic, can’t a teaching be prophetic? Compliance with the enablement requirement of 35 U.S.C. 112(a) or pre-AIA 35 U.S.C. 112, first paragraph, does not turn on whether an example is disclosed. An example may be “working” or “prophetic.” A working example is based on work actually performed. A prophetic example describes an embodiment of the invention based on predicted results rather than work actually conducted or results actually achieved. Once again, science fiction cannot be a teaching. Paul – be careful with the “it is a teaching for whatever it discloses.” as the case oft cited for presumed 112 support for 103 does NOT mean that NO 112 type of support is required (in other words, science fiction cannot serve as a proper basis for 103 – even though some of the regular examiner types that post here are confused on the matter). I have to ask whether this discussion is wholly theoretical or whether you are looking for an argument to make before an examiner, the PTAB, or an Article III Court. It is no longer really disputed whether Gilbert Hyatt (US 4,942,516 A invalidated for lack of enablement) or G Boone (US 3,757,306 A). The respective Claim 1s show the difference. Here is Hyatt’s claim 1. (3) an integrated circuit processing circuit coupled to the integrated circuit alterable memory and processing the computer operands stored by said integrated circuit alterable memory in response to the computer instructions stored by said integrated circuit read only memory, wherein said integrated circuit processing circuit is implemented on said single integrated circuit chip. Boone’s claim 1 is above in the image. Let’s assume the same examiner is reviewing Hyatt’s and Boone’s applications. The critical limitation is Boone’s semiconductor substrate. Hyatt’s Claim 1 (unenabled) tells me that the knowledge that the metes and bounds encompass is present among inventors, and Hyatt has even provided citations. I also know that fabrication research was also out there. What stops me from cobbling together a bunch of publications to construct an obviousness rejection? I would not have cobbled together all these published documents without having Boone’s application. Now in maxdrei’s case to make the obviousness objection, I need to find some known technology that combines relevant 1930s technology with current magnetic technology. Only then have I demonstrably not used hindsight. In simplified Kantian terminology, only then could I use the combination of the 1930s reference with modern magnet terminology without introducing significant synthetic terminology that I identified and combined through the use of hindsight. Here is the pdf of Boone’s patent. The image of Boone’s patent is too hard to read. The first sentence above should have been the following. The discussion I’ve had with Ned involves the word “new” as used in the patent statutes. Ned thinks a newly DISCOVERED aspect of nature is not patent eligible because it is not new. I argue the “new” as used, for example, in 35 USC 101, must mean newly known because if it means absolutely new in the universe, we have no way to determine whether the claimed subject matter exists three galaxies over, or if it existed there 4 billion years ago. I hope this comment is a joke. Thermionic vacuum tube (valve) diodes and solid-state diodes were invented separately but at about the same time in the 1870s (and again in the 1880s for vacuum tubes or valves — Edison was the second inventor). Tommy Flowers was building vacuum tube-based logic circuits in the late 19-teens and 19-twenties. Shockley and Pearson could not build the transistor without solid-state manufacturing techniques developed in 1940s and patented in the 1940s and 1950s by Scaff, Theuerer, Ohl, Storks, and Teal. Unless the Roswell flying saucer included a manufacturing system or a handbook that was was written in an earth language and that described manufacturing solid state devices, nothing at Roswell could have helped Shockley and Pearson develop the transistor. Diodes are not transistors. I’m sure there are cover stories as to how the transistor was developed out of diode work. Nevertheless…. And even if it was only Velcro (sorry, hook and loop) that came from Roswell, my point remains the same “new” must mean newly known, as we have no way of knowing what is absolutely new in a 15 billion light years radius universe that is on the order of 15 billion years old. I am a physicist although my medical physics work in non-invasive imaging is not significant. I have occasionally done circuit design. A transistor is a solid-state triode (or sometimes pentode) valve. You are correct that it is a very small step conceptually from a diode to a triode, which was invented in the 19-naughts if I remember correctly. From the standpoint of early modern epistemology, 35 USC § 101 seems to require that a claim be directed to a combination of knowledge, whose metes and bounds in simplified Kantian terminology encompass novel synthetic and posterior knowledge, which becomes prior art on the effective filing date if the patent application is published. If we really want to extend the statutes to cover extra-terrestrial prior art, the statutes have to be modified to uses 4 dimensional space time coordinates and require that the prior art be in the timelike past of the effective filing date (also a 4 dimensional space time coordinate). You really need to lose that artificial complexity of the “language” translations Joachim. I “get” that you are comfortable with it, and that you feel that it gives you some type of “universal” framework, but it simply is not really needed. I used to be on the MIT faculty, and I am pedantic. You did not complain about my use of physics terminology on a physics question. Using epistemological terminology on an epistemological issue (35 USC § 101) is no different as far as I understand. Kantian terminology provides precision whereas the phrase “abstract idea” comes from grammar and really does not belong in patent law unless grammar as a matter of law is under discussion. That’s part of your (and the) problem: 35 USC § 101 is not an epistemological issue. It is a legal issue. And I suppose that 35 USC §§ 102, 103, and 112 pose no issues in science and technology. Now if you wrote that 35 U.S. Code § 119 poses only legal issues, I would agree. Love the picture, but the point remains: you are attempting TOO much “epistemological” treatment of a legal issue. some comments still stuck in moderation, but I am enjoying the exchange Joachim. No doubt as you could pick up (even being pedantic) – ALL of these occupations are occupations concerned with (gasp): business. Yeah. Try telling that to Ned. If you look at the first Shockley and lilienfield transistors they’re so nearly unimaginably primitive that no “alien tech” helped them out. It was practically college experimentation type sht. look how primitive that is. It’s literally a piece of glass broken in half with a little bit of stuff put on it. And that is the first MESFETish device according to wiki and everything I’ve ever heard. And it was dated 1930. Unless you think the “alien tech” specifically had to do with changes between that above and 1940’s style transistors (on a spacecraft presumably from 10000000 years further in advancement than us) then that whole hypothesis is literally ta rded. The patent noted above is not a “hur dur” cover story. It practically is a transistor. It is certainly a switch, though its amplification properties are likely not that great. Perhaps “transistor” is now too broad a term. Schockley’s patent is to bipolar transistors, not FETS. Actually, what was found at Roswell were integrated circuits. So putting two circuits of the above on the same work-piece took an alien spacecraft to achieve? Literal, not even figurative, ta rdation is required for that hypothesis. But look, I could sympathize with your BJT (or BJT IC) hypothesis a bit if not for the fact that other people were doing a lot of work in the area of mat sci through the 20’s and 30’s that then led up to the work in the 40’s, specifically to understand and perform what is now known as doping. I could cite much for you, but you’ll have more fun looking that up yourself. Genius no doubt was at play, genius that gets too little recognition these days. And a lot of money. But that’s all it was brosefupogulous. Sure, people were working on stuff. Those are the people the army went to with hints and information to push them in the right direction. You read the book yourself. I should also note that I believe the near certain reason that this ta rded hypothesis continues to this day is because it was such a huge development that gets so little historical attention (very few museums, all of the documentary information and publications aren’t compiled in one location from all the sources of the revolutionary developments that took place so that people can see how the development took place all in a line). I actually think there is a real need for someone to go through all the histories and do the compilation for realz complete with database for all the relevant infoz. Not just to do away with the alien hypothesis, but rather so that the people of the world can marvel at the revolution that took place. that may support a conclusion of obviousness may be slightly defective. The vanilla rationales consist of the following. Should we replace “predictable results” wherever it occurs with “only predictable results”? 2) the Symbiota/Indigo Spangenberg neo-Linnaean taxonomy patent application PCT/AU2013/000557 (Selection of symbiota by screening multiple host-symbiont associations). There may have been reason to combine the pre-existing techniques and procedures to obtain the predictable results, but the structure created in the Jeffreys patents (the genetic fingerprint) tells us so much more in a way that is unpredictable. The neo-Linnean taxonomy (a structure) that Spangenberg’s invention creates in many ways is predictable and an interesting improvement over prior-art taxonomies of symbionts, but its true value lies in selecting valuable combinations of symbionts to improve crops. This new taxonomy makes it possible to select analytically (by computer) those few symbiont combinations likely to be beneficial from the tens of thousands or more possible combinations of symbionts of less or no benefit. “Should we replace “predictable results” wherever it occurs with “only predictable results”? MPEP 2145 explains how unexpected results can rebut those rationales. I am not sure MPEP 2145 fully covers the case of the Jeffreys patents or the Spangenberg application. In the Jeffreys patents and in the Spangenberg patent application, there is reason to combine (with no teaching away from the combination) and there are predictable results, but there is so much more than the predictable results in the technologies of the Jeffreys patents and of the Spangenberg application that I suspect the inventor required a flash of insight to understand what he was seeing. The Spangenberg claims seem to have been written with attention to possible anticipation rejection by combining establishment of the neo-Linnean taxonomy with finding an effective symbiont combination. I am not familiar with the claims you reference, so I defer to your analysis. But where the combination of A and B produces both results X and Y, if X is predictable and Y is unexpected, the existance of unexpected result Y should be able to overcome a rationale based on expected result X. That EXPLICITLY has no bearing for the patent world here in the US. “Taxonomies” aren’t eligible subject matter. In re Lowry, 32 F.3d 1579 (Fed. Cir. 1994) tells us that a data structure is patent-eligible. A taxonomy is a data structure — particularly in the case of the Spangenberg Application. One could consider a taxonomy a specialized example of a database, which has long been considered a patent-eligible manufacture under 101. We occasionally see allowance in the case of an improvement to a database. The CAFC recently reviewed a patent claiming a database improvement. Even though the decision does not reference In re Lowry, Malcolm should read Enfish, LLC v. Microsoft Corp. (Fed. Cir. May 12, 2016). The Spangenberg Application discloses analyzing ribosomal nucleic acid to produce an electronic taxonomic database, which is the used to select useful groups of symbionts. In addition, this Application directs claims thereto. From an epistemological standpoint the claims define the metes and bounds of a method that is novel and new and that represents synthetic knowledge enabling raw data to be transformed into a data structure (taxonomic database and statute-eligible manufacture) from which symbionts with optimal genetic relationships to be beneficial can be selected. Sometimes to make a proper eligibility argument, one needs to under multiple arts (technological areas — in this case software engineering, biochemistry, and classical biology), the statutes, the case law, and epistemology. Facile assertions with respect to eligibility should not be accepted. Random (or somebody else) can you help out here? At 7.2, I reply to Random’s Point 7, that anticipation is the “epitome” of obviousness. anon replies and there follows a dialogue between us. But this dialogue leaves me unsatisfied. So below I try to set my point out again, afresh, to see if I can interest any other reader in my point. Suppose my claim is directed to some sort of electrical machine. There is a Ref A, that the PTO cites against my claim (filed in 2010), under both 102 and 103. Ref A was published in 1930 (say). I reply on the 102 point that A is not enabling. I prove that in 1930 there was no magnet strong enough to put into practice what A discloses. Therefore the novelty attack must fail. When it comes to 103 however, I have a different task, for A falls now to be read through the eyes of a PHOSITA in 2010. And for that person, strong enough magnets are by now totally conventional. anon tells me that one always reads A as of its 1930 date of publication. German Supreme Court judge Rogge used to tell me that one should read it, also for 102 (! ), in 2010. The Established Caselaw of the EPO has it as 2010 for 103 but 1930 for 102. How is it at the USPTO? Well, Max, let us just say that anon is of the school that would cite Star Trek’s transporter as anticipating prior art on the grounds that someone will figure out how it works, especially if the inventor has. Be that as it may, Ned, here in this dialogue anon seems to have left that school behind him. Perhaps it was you who convinced him to leave? But, apart from that, are you leaving it to Random Guy, to answer my question? Or do you not understand my question? A rather odd comment, seeing as my views on this topic are consistent with my views across the board. Where is this “seem to have left.. behind” coming from? A can only teach you what it possessed as of 1930. You are still making the mistake of trying to move the “A” reference date. In your current example, it is the OTHER art that sinks you – NOT the “A” art (or any semblance of the “A” art date moving). Ned – bite me – your reply has nothing to do with any position that I have ever put forth. What “other” art? Art published later than 1930, you mean? Can I formulate an obviousness attack using a combination of A and this other art? What other art, you ask? That’s silly MaxDrei – your pwn hypo is providing that this is a 103 rejection. Can you formulate an obviousness attack? Silly? Perhaps. But necessary, to pursue my point. Through what prism is obviousness to be assessed? The PHOSITA perhaps. And on which date is the PHOSITA mulling over the issue? 2010? Silly questions, I know. But necessary, it seems. You remain off on the wanting to focus on the PHOSITA. NO ONE is debating that point. But the references used by that person – those references have specific dates. Those dates NEVER change. The references teach what they teach as of their date – THAT also never changes. 102(e) became a wildcard because it was not intended to be prior art because it was neither of the known or used type nor of the bar type. The Supreme Court decided it was nevertheless 103 prior art, but the inventor could still swear behind. That decision by the Supreme Court was a mistake. But rather than fix it in the AIA so that the US could become harmonized with the rest of the world, the AIA double down and extended the principle of 102(e) to foreign priority type art. The people in charge of crafting the AIA certainly were not really in favor of harmonization. An American can now patent his invention in the ROTW, but not in the US, because foreign prior art is good against his US application for obviousness purposes only in the US. How is this good for the American inventor? It makes no sense at all. Makes no sense Ned? On the contrary. Maxing out the possibilities for using secret prior art to attack a claim as obvious is something that makes a lot of sense for a corporate bulk filer, who can use all of that bulk, at full power, against any nuisance tiddler that incurs his displeasure. In Europe, there are two mechanisms for restraining the aggregation of patent power by the assiduous corporate bulk filer, that are nowhere to be seen in the AIA. The first is the restriction on secret prior art to novelty attacks. Art 54(3) EPC. The second is the availability of your own earlier filing P, as secret prior art, to attack the novelty of your own later filing Q. It is almost as if Big Corp compiled from ist experience under the EPC a wish list for the AIA. Perhaps the AIA was sponsored by Big Corp, aiming to create a free run with its own pile of patent filings, undisturbed by the nuisance USPTO filings of others. Why do I write “nuisance”? Just observe for yourself what happens under the EPC. When several filers hit on much the same contribution to the art, and each files independently, around the same date, they mostly all get to issue with something. How irritating for each CEO. Much better that one corp sweeps the board, eh? Max, I think you are right that the big international corporations. They’re behind getting rid of both US first to invent, and “fixing” the self collision problem you describe: IBM and others lead the way to eliminate co-owned prior art from being 103 references. Now, they have eliminated such from even being 102 references. The stink on the AIA is unmistakable. If PHOSITA would have known about the 1930 document, and that document didn’t imply or indicate that magnets of the time were sufficient but indicated that if a magnet strong enough could be made, then so too could the invention, and if PHOSITA would have been aware that sufficient magnets were now available, then I don’t see how anons position could be supported. If on the other hand, the 1930document wrongly asserted that the invention could be made with existing magnetic technology, and the 2010 inventor was the first to recognize that error and find the cure, then I’d say the invention was not obvious in 2010.
anon says that what 1930 discloses is what it disclosed in 1930. He and I and the EPO agree on that. But that is not enough, when it comes to performing the test what was obvious in 2010, for then the prism is the PHOSITA in 2010, who reads the 1930 doc in 2010, obviously through the eyes of a skilled person in 2010. These matters would all be beyond argument, except that some people think you must read the 1930 doc through 2010 eyes, even when examining whether 1930 doc prejudices novelty of the 2010 claim. What is “obvious” for a skilled Person in 2010 when reading an old (1930-published) doc is different from what was “disclosed” by the 1930 doc to a reader of it, who was reading it in 1930. OK? The 1930 reference cannot disclose one iota more than what it could disclose on its date. The date does not move. Now for a PHOSITA, and for a 103 rejection, that single reference will likely NOT be alone – but it is the OTHER items – with other dates – that will change the understanding of the PHOSITA. Once again MaxDrei – you are conflating the timing of different things. Yes, I understand what you said and would not argue with it. It is only when that secondary reference itself exists (e.g., the item no longer is “Science Fiction”) that a proper 103 can be formed. But note that this formation does not change anything AT ALL about the “A” reference. Science Fiction simply is not a proper basis for obviousness rejections. Your hypothetical is not analogous. If your claim sounds in function “a machine structured like this with a magnet that performs this function” then Ref A was not anticipatory, as it never had a magnet that performed the function. If the claim sounds in structure, then Ref A is anticipatory because whatever you’re using the magnet for is unclaimed intended use. Assuming you mean the former case, the fact that Ref A is very old is likely irrelevant. If a claim has a 2010 date, there’s little distinction between citing a reference from 2009 or a reference from 1999 or a reference from 1899. Your situation (assuming the claim had a functional limitation) sounds like a simple 103 where Ref A is combined with Ref B teaching a new magnet in simple substitution. An “anticipation is the epitome of obviousness” situation is where it’s unclear if Ref A disclosed limitation X, so you cite Ref B which definitely teaches X, with a motivation. Thus you either have a true obviousness situation or you have committed error in your motivation because Ref A already had X and thus wasn’t motivated to modify to get it. That error is harmless error, as the failure of the 103 proves a 102, and the claim is still unpatentable. Anticipation is the epitome of obviousness. Kind of you to reply to #12, Random. But I feel I haven’t got my point across to you either. As I stipulate at #12, Ref A from 1930 teaches an electrical machine that uses a strong magnet. It isn’t enabling because back in 1930 there wasn’t a magnet known that was strong enough to deliver the required functionality. So, the novelty attack based on A fails. But by 2009, strong enough magnets were banal, commonplace, bog standard, part of the common undergraduate textbook knowledge of the skilled person in this particular art. When such a person reads A in 2009, a magnet that is strong enough to deliver the functionality required cannot be other than implicit, automatically “read into the teaching” of A. Nevertheless, in 2009, A is still not a novelty destroyer (because for novelty you read A as if you were reading it in 1930) even while, in 2009, it alone, without requiring support from any second reference B, it renders the claim hopelessly obvious. My point is that legal clarity requires rigorous separation of the different legal concepts “lacking novelty” and “obvious”. That is simply false. The reference alone does not change what it is over time. No I do understand I’m just doing a poor job of explaining. Let’s put some concrete things in there and expand the hypo to two claims and two timeframes. In 1930, Ref A is published which expressly states that in a system with particular structural limitations (we’ll call this context C) sits a “strong magnet” (which we call M). Ref A explicitly posists “In context C, M.” M is not strong enough to produce function F when placed in C.
1. A system comprising: In context C, M.
2. A system comprising: In context C, M such that F.
Claim 1 is anticipated by Ref A. Claim 2 is not only not anticipated, but (according to your hypo) non-obvious and thus patentable. But for whatever reason, Claim 2 is abandoned and ‘931 never publishes. In 1980, the magnet group gets together and decides that strong magnets (M) will now be defined as being some sub-group of strong magnets (i.e. “modern” strong magnets) such that they would produce function F in the relevant context. This shift of definition we will denote as M->M(prime). Claim 1, one might opine, is easily disposed of. It was anticipated in the ‘931 application, so it must be anticipated in 2009. Claim 2, one might also argue, is also anticipated because M will inherently cause F in context C.
The reason is because even though Claim 1 of ‘009 uses the same words as Claim 1 of ‘931, they are not the same claim. ‘931 is construed with M=M, and ‘009 is construed with M=M(prime). Consequently, Ref A is insufficient to anticipate either Claim 1 or Claim 2 of ‘009. Claims 1 and 2 are easily made obvious, however, because one simply need cite Ref A and a Ref B (possibly the notes of the 1980 symposium, or a similar textbook) to teach the new strong magnet, and apply simple substitution. Ref A/B render the claims obvious. This is not a situation where anticipation is the epitome of obviousness, since there is no manner that Ref A could be construed to anticipate even Claim 1, because Ref A never teaches M(prime). However, one can (and this might be what you are getting at) generate a one-reference 103 and find Claim 1 obvious solely over Ref A. However, here anon is correct – you cannot do it solely based on the one reference. Rather you need a finding that one of skill would have recognized the difference between M and M(prime) and that the disclosure of Ref A, when filtered through the lens of M->M(prime) would suggest the invention of Claim 1. I agree you can make a one-reference 103 (since that is what you are really asking for without knowing it) but on the condition that (as anon says) the record contains the re-definition (or the definitional shift) of M->M(prime). In other words, the 1980 symposium or a similar textbook would need to be cited in either case, though it need not technically be part of the rejection. Either way you would need to cite Ref A and Ref B, but you could make a 1 or 2 reference rejection. There is nothing odd or paradoxical here. M and M(prime) may use the same words but don’t mean the same thing. One reference obviousness rejections are not impossible (neither are two reference anticipation rejections for that matter). One of skill is not “forced” to use “only” the conventional meaning – they may be aware of what the term meant today and also be aware that it meant something different at another time. Once you admit that Ref A doesn’t enable the instant claim, anticipation is out the window. All obviousness requires is a rationale as to why it is obvious with sufficient evidentiary underpinnings. A can form a one-reference 103, but it can’t do so “without requiring support from any second [source]” as anon correctly points out. Rot in hell, Re pu kkkes. Are there no other places on the internet you can slum it? The better question is why after more than eleven and a half years of the same blight – and after repeated “calls” by the editors here for a “better ecosystem,” is he STILL slumming it here? Well more than half his blight has absolutely zero to do with patent law. What’s the point of “law”? Time for the afternoon cup of coffee. Like noticing that this is a PATENT law blog. Why would any sophisticated examiner use an anticipation rejection? Wouldn’t it be smarter to almost always rely upon obviousness instead of anticipation? Depends on the claim and the reference, of course. Tons of claims are anticipated and it’s easy to show that that are. So other than the usual arguments (Graham, etc.) why is the toaster-in-a-car patentable in some situations and not in others? If it is literally just setting the toaster on the passenger seat and plugging it in to the lighter with an AC/DC adapter, I think we agree that it is not patentable. No changes in any of the elements. But what if the toaster is built in to the dashboard? OK? So a new structure makes it OK? Or, what would it take (other than producing oranges) to be OK? Oranges is a bit far-fetched. But suppose (just for the sake of argument) that the heating element of the toaster is used in the car also in some sort of communication system. Transmitter, antenna, navi, GPS, phone, traffic management, whatever. that might be inventive. Because then the Car + Toaster Combo delivers more than just the collocation of Old Car +Old Toaster. Those are problems that would have to be solved, and where the real invention lies. So, if a claim was simply “A traveling bread cooker comprising, a car; and a plug-in toaster,” it’d be obvious. But as that claim expands to include venting solutions, GPS that disables an alternator if the car approaches a gas station while the tank is less than a threshold full, or gelatinized butter that doesn’t drip at normal melting point, etc., it would become non-obvious over those references. But that’s different than Les’ original comment, which is that it would be non-obvious to plug a toaster into a car because of those problems. That almost seems like more of a ‘teaching away’ issue. But if a reference says, “don’t do A+B because that could cause a fire”, a claim to A+B is actually anticipated. Agreed. But I’m not sure how that makes Les right. He appeaes to disagree with this. If by “we agree”, you appear to be wrong. Some here are pushing such simple “A colocated with B” combinations as non-obvious. If by “we agree”, you mean we all agree, you appear to be wrong. > What if the toaster is built in to the dashboard? OK? So a new structure makes it OK? Or, what would it take (other than producing oranges) to be OK? My bread-and-butter is software patents, where the bar of patentability has been raised quite a lot: “Your claims must recite a legitimate, compelling point of novelty” is the best weapon against both 101 and 102/103. So I’m frequently surprised, even shocked, when I encounter recently-issued patents in mechanical and electrical fields, where bar really does appear to remain at: “It’s patentable if it’s new.” No matter how minor the distinction; no matter how questionable the merit. Different = patentable. 2015 was the time point of the widest gap between these standards. Several cases in 2016/2017 have dialed back certain aspects of § 101 in the field of computing: Visual Memory, McRo, Enfish, Bascom, Amdocs. The standard is still quite high, but perhaps not as dismissive and overgeneralized as it used to be. I will forever credit Robert Bahr’s memoranda updates to the IEG as establishing a “new normal” in the PTO (even though examiners still pretend like they don’t exist… but the PTAB stands ready to reverse instances of material noncompliance). And yet… the standard for the other 75% of issuing patents remains low. Surprisingly low. Probably too low. The contradiction gives rise to some absurd results. Just this week, the PTAB issued a decision in Bancorp v. Solutran holding that a check-processing system was not only patent-eligible, but it shouldn’t have even raised a significant § 101 question. Why? “Because it involves paper check processing” – which is almost per se not abstract. Interestingly, a different panel of the PTAB reviewed strikingly similar claims in 2015: Fidelity v. DataTreasury. It reached the opposite result. The kicker is that it was presented with the same argument – that paper-check-processing systems were patent-ineligible – and that panel’s response was: “lol no.” Literally, a one-sentence acknowledgment that the patentee had presented the argument… and a one-sentence rejection of it. The End. (c) It has no basis in the text of 35 U.S.C. or 37 C.F.R. Why? “Because it involves paper check processing” – which is almost per se not abstract. What kind of “processing” of this “paper” are we talking about? i.e., is it really “paper” that’s being “processed”? How much does your checking account weigh these days? Denser than before? Higher melting point? I’m not expressing agreement with either ruling. I’m pointing out that this pair of cases sits at the intersection of “logical” inventions that are held to high standards under §§101-103 and “physical” inventions that aren’t, and it has prompted two extremely strong opinions with opposite results over materially identical claims. That’s all. Well, 35 USC has been interpreted by the Supremes so there’s less of a problem there. The fix is easy. Just get rid of data processing and logic patents. They never belong in the system in the first place because logic is ineligible for patenting. End of problem. Done. Oh but wait! You’d have to find an honest way to make a living. And you’re one of the important people. Your feelings – and your typical dissembling with “logic” patents – are noted. (d) it is driven by the wrong branch of the government. So other than the usual arguments (Graham, etc.) why is the toaster-in-a-car patentable in some situations and not in others? If it is literally just setting the toaster on the passenger seat and plugging it in to the lighter with an AC/DC adapter, I think we agree that it is not patentable…But what if the toaster is built in to the dashboard? Because the scope of the claim defines the invention. If you’re going to claim a particular manner of incorporating the toaster into the car, that’s far more likely to be non-obvious for precisely the reason you think – anyone can sit a toaster on a seat and use conventional technology to allow the car to power the toaster. For consequent Office Actions, some of this may very well be a result of the Office Action being less demanding to compose as a 103 than a 102. I’ve had a few cases where the principal reference in the main office activity was not close. In the wake of pointing out the lacks of that initially reference, the Examiner seeks again and finds a greatly improved reference. The new dismissal in the following office truly could be, and most likely ought to be, construct exclusively with respect to the new reference. Be that as it may, it’s considerably simpler to simply attach the new reference under 103 than to compose a totally new Office Action. Agreed. See comment 3 below. Unless I can anticipate all of the claims in the set, I intentionally make my anticipations into obviousness rejections and include a citation to Ref A in my Ref B mapping for the limitation just so I don’t have to redo my headers. Anticipation is the epitome of obviousness. You should take the extra 150 seconds to provide the 102 in alternative to the 103. Ignoring that this is the correct practice, there is a (tiny) chance that the 102 rejection could prevent a 2nd non-final or board reversal. Anticipation may be the epitome of obviousness, but they have distinct relationships with secondary considerations of non-obviousness. If the citation is made you will never have to do a 2nd non final or be reversed. Applicant has actual notice and it’s not a new ground to go to 102 from a 103 when the teaching is the same. I.e. if he makes a persuasive argument against the 103 in an appeal (secondary considerations for example) I can just convert the rejection to a 102 rejection right there and then and maintain the appeal. See MPEP 1207.03a(II)(2). The reason you have to go non-final before going final is largely a matter of procedural due process. When procedural due process is met you don’t have to start over, it’s essentially harmless legal error. Just one of the many reasons all examiners should be lawyers. Coming from one who evidences such a clear LACK of understanding of the law, your comment is quite comical. For anticipation, Ref A has to be read as of its date of publication. But when Ref A is the main reference of an obviousness attack, however, it has to be read through the eyes of a PHOSITA deemed to be reading it one day before the date of the claim. That difference can be decisive. Or is it different in the USA? Is that why you write that anticipation is the epitome of obviousness? Without being snarky, you appear to be mixing views across Sovereigns (and doing so with a catchy phrase that itself is not accurate within the US Sovereign). ANY answer you get then will not be worth anything. I’m just curious to know whether, according to US jurisprudence, when Ref A is the basis of a novelty attack on a claim, is its disclosure what the PHOSITA would have derived from A on the publication date of A or, perhaps decades later, what PHOSITA derives from A on the filing date of the claim. Or has this important distinction not yet even been recognised, judicially, within the USA? Ref A is what it is. Why do you see the possibility of different dates from a single reference? 2. the basic rule of construction of published documents, that they mean what they meant on the day of their publication. But you’re in good company, in not appreciating the point. Judge Rogge of the Supreme Court of Germany couldn’t see it, till it was explained to him as the established caselaw of England and in detail by the established caselaw of the Boards of Appeal of the EPO. To my mind, it’s very important not to blur the distinction between novelty and non-obviousness. The EPO never did, nor England. But Germany used to, and the USA still does. The reference remains what it is – no matter how that reference may be applied differently (in our sovereign, that would be being applied in a 102 or 103 sense). It is NOT “how it is being applied” that determines the date of the reference. The date of the reference remains the date of the reference. You have not provided a point to be appreciated. Leastwise in any sense of how a single reference may have a floating date. It appears that your point 2. (basic rule) conflicts with what you merely want your point 1 to provide, but your point 1 does NOT provide a floating date for a reference. The date of a reference is fixed – immaterial of whether or how that reference may be applied. Further, you want to claim that the USA blurs the distinction between novelty and non-obviousness, I say thee nay to that point. Sure, I will grant that if you read the quips on these boards from some of the typical examiners, that blurring does seem to be present. But that is only because these examiners are not understanding how our US law actually works. These examiners being wrong does not make your view of the blur correct. As to Judge Rogge, it seems that you may have a particular case in mind. Can you provide a link? Rogge: no particular case. Rather, the position he tried to defend when writing articles (in German) for legal journals. Floating date? I mean the date for determining (in relation to any given claim) what was obvious. That date “floats” with the date of the claim under scrutiny. Banal example: Ref A was published in 1930. It discloses and enables a circuit for an amplifier of an electric signal. The claim, dated 1980, is also to an amplifier, as it happens, the same amplifier as the one A published in 1930. Just for the sake of argument, suppose the Ref A circuit fulfils all elements of the claim. Suppose further that the claim explicitly recites the presence of a “transistor”, and this explicit recitation is the only thing that distinguishes the claim from A. The skilled person reading A on its date of publication would not have come to the idea of using a transistor (because transistors hadn’t been invented, back then). But by 1980, transistors had become so ubiquitous that the skilled person reading A would not have thought of using for that amplifier anything other than a transistor. Hence, it can be important, whether you read A as of 1930 or 1980. Novelty is about “planting the flag” somewhere where nobody has been before. Even somebody back in 1930. That must be enough to constitute a “point” that you are capable of “appreciating”. Am I to understand that in the USA, when testing novelty, Ref A, published in 1930, is assessed for its disclosure content as if it were a 1980 publication? Am I to understand that, in the USA, the disclosure content of A is not constant, but steadily “floats” upwards, increases, as the years go by? You still are not making any point as to the date of reference A (your original supposition). Reference A carries with it but one single and solitary date – NO MATTER AT ALL to what legal test that reference may be put to. I think that you are confusing yourself with the difference between novelty and obviousness. (in your last hypo, you are also confusing the date of the other items of art being brought to bear – the date of Reference A in your new hypo remains exactly the same. “Of course, for obviousness, you read A through the eyes of the skilled person in 1980.” – um, no. You do not shift the date of reference A, because you do not NEED to shift the date of reference A and what reference A “teaches” in 1980 is still the same as what reference A teaches in 1930. You are confusing the date of the skilled person and the date of the reference – that is clear error. What a reference teaches does not – and cannot – change over time. I would hope to see the rate of anticipation rejections be low, and I’m surprised it was ever over 50%. We’re supposed to be knowledgeable about the state of the art – how can you possibly draft an application if you don’t qualify as OoOSitA, at a bare minimum? – and if you are knowledgeable, why are you writing claims that are anticipated? Except for very obscure fields or terrible rejections by examiners (and let’s not kid ourselves and pretend that applies to every rejection), I think a 102 rejection sold not be just rare, but embarrassing. I think the prevalence of 102 rejections stems more from an deliberate prosecution strategy than practicioner ignorance. That said, it’s hard not to look down on an “inventor” who deliberately uses an examiner to discover the scope of their “contribution”. You mean that examination and fee they paid? How do you feel about the asymptotically disappearing Jepson claim format? You are WAY out of line having such contemplations Ben. I think Thomas Jefferson rolls over in his grave whenever an inventor files an application to A and ends up being granted A’BC”D’EFG’. On the other hand, Rich probably gets some ghostly turgidity every time that happens. Incremental improvements often times have great value. Your attitude is exactly what’s wrong with many at the Office. Examiners, government employees with little training, who have never even bothered to try and invent something new, looking down on people who are trying to innovate… You really should reconsider what you are doing for work. I think he was referring to the practice of initially filing an extremely broad claim that gets repeatedly and significantly narrowed during prosecution – e.g. starting with A and ending up with A’BC”D’EFG, rather than starting with A’BC”D’EF. I think initial claims *should* be slightly too broad, since it’s very easy to narrow a claim but difficult to expand one. But *slightly* too broad is significantly different from inconceivably broad. (i) this is the first time this phrase has been posted in this discussion. So are you just fighting a strawman, Mal? (ii) it appears that you agreed with my comment, so maybe this comment was misfired? (iii) this thread *was* going so well. It was an attempt to sarcasm. The quotes were intended to show that the comment was not my own but that backfired, evidently. I don’t disagree with you but his tone and comments were not as well balanced. I’ve seen my share of over broad claims, but what does the office care if an applicant narrows claims iteratively? They have to pay for the RCEs. Maybe if examiners would suggest allowable claims that are narrow it would move the process along. I have no problem with incremental innovation, and I do not have anything against the applicant who claims ABCDEFG and gets A’BC”D’EFG’ or even just ABCDEFG’. I think the small fraction of practicioners with reading comprehension issues are a problem for the office, but far be it from me to give you career advice. Yeah. Them “practicioners” are pure eviiilll. Were you trying to confirm that you’re in that small fraction? I also forgot to say thank you for the career advice Mr. GS-7. We can’t all aspire to having a job that’s the equivalent of a DMV employee. It’s certainly not unusual for a patent attorney to draft 50-100 applications a year. If they are lucky, maybe 25% fall within the same “field of endeavor.” As such, many patent practitioners are drafting applications in a multitude of different (if not very disparate) fields of endeavor. It is entirely unreasonable to expect the patent practitioner to be an expert in every field of endeavor. Also, the purpose of a patent specification is to describe how to make and use the invention. Once filed, the scope of that disclosure does not change. However, the patent system explicitly recognizes that what is patentable (from that disclosure) is not set in stone. Applicants don’t know how Examiners may interpret claim language. They don’t have perfect access to prior art. Sometimes, an inventor may think they invented X but they also invented an improvement to X. However, inventors aren’t necessarily prowling through reams of prior art to determine if what they invented is novel. Seeing as how many attorneys (and presumably applicants) can’t even draw chemical formulae using the proper, well-accepted conventions in Chem(Bio)Draw or similar software, I can’t imagine how they could figure out how to use the ever-so-slightly-more-nuanced SciFinder to search for prior art. G-d forbid they ever figure out how to use STN… then I might actually have a set of original claims that aren’t all anticipated. My favorite, though, is when attorneys bring up the list of all the compounds in the case up into the independent claim and cancel chemical compounds one by one. Easy counts, baby. In a non-snarky and educational manner, please realize that we are not OoOSitA (whatever that means) – nor are we called out to be. Inventors simply are not required to be conversant with the state of the art. They just are not. There is NO requirement for any type of prior art search of any kind. Now I readily grant (and even have recommended on these pages) that Best Practices brings the advice of obtaining the best possible prior art search prior to drafting an application. now THAT is a client’s decision. ***I have had a client actually “get mad” that I did a two minute internet search and found dead on art – in the client’s line of business. I was covered because my engagement specified that I retained that ability and the client had agreed to it, but the “moral of the story” is that what you suggest is – or can be – not the “fault” of the scriviner. And by the way, the client that was mad was a “Big Corp” player, and not a small mom-n-pop type of outfit. “In a non-snarky and educational manner, please realize that we are not OoOSitA (whatever that means) – nor are we called out to be. I’m not suggesting that a prior art search is necessary. However, I *would* submit that we patent attorneys, with our various advanced degrees and technical and scientific knowledge (as well as our knowledge gained through reading thousands of patents and disclosures) are at least as skilled as OoOSitA. I would argue that that’s a minimum level of skill required in our profession, in fact, because if you can’t understand what you’re writing about, how can you possibly be sure you’ve met the requirements of 112? I.e. if it’s not sufficiently enabled that *you* could build it then how do you know it is sufficient for someone else? And given that, we should be aware of what’s generally known in the field, and at a minimum, what aspect of the invention is novel. I’d also argue that while inventors and companies are not required to perform prior art searches, they should also be aware of what’s generally known in the field. Either their patent committees or us, as their attorneys, should be acting as a filter to avoid wasting money on anticipated claims. The “shoulds” of your last two paragraphs do not carry. Go ahead, now. You’re a very serious person. You seriously are having a problem understanding what “does not carry” means? To second what several comments here have already suggested, Fed. Cir. reversals of 102 rejections because of even one known-combineable-nit claim element missing from a single cited 102 reference encourages more PTO use of 103 rejections instead of, or in addition to, a 102 rejection. Who wants to get “bounced” cases returned? I.e., I’m not sure if the KSR-repeated “the POSITA has common sense” for a 103 had that much effect on reducing 102 rejections? This looks like a fun dataset. For subsequent Office Actions, some of this might just be a product of the Office Action being easier to write as a 103 than a 102. I’ve had several instances where the first reference in the first office action was not very close. After pointing out the deficiencies of that first reference, the Examiner searches again and finds a much better reference. The new rejection in the next office really could be, and probably should be, based solely on the new reference. However, it’s much easier to just tack on the new reference under 103 than to write a completely new Office Action. I’m sure that’s a small part of it, but I would think that the obvious mechanism of attorneys amending around the 102 would dominate. True. Though even then I’ve seen plenty of cases where the base reference really doesn’t apply anymore. It’s just easier to write. Could also be a “you get what you measure” thing, too. For Examiners, it is much easier to get an error with a 102 than with a 103. For me, if I have any doubt, I’ll just make a single reference 103 instead of a 102. Also, if I don’t fully explain a 103, I might still be able to go final, but if I miss something in a 102, it’s black and white that I need to do another non-final. Well, if you ignore, as 97% of Examiner’s do, the bit about the inappropriateness of merely conclusory assertions regarding motivation for making the combination and impermissible hindsight. How do you think examiners should be taking into consideration hindsight while not requiring an explicit TSM? I meant that most of the OA I see conclude 103 rejections with a single sentence that begins with “One of ordinary skill in the art would have been motivated to combine B into A in order to” and ends with about 5 more words taken from the preamble of claim 1 or from a paragraph from the summary section of B without providing any justification for the assertion. These are “merely conclusory” and deemed inappropriate by at least one Supreme Court ruling (it may have been KSR). If there is any motivation for making the combination at all, it clearly comes only from the application being examined. Where the Examiner cannot articulate an acutal explanation as to why OOOSITA would have changed the primary reference, the rejection should not be made. That is how I think an Examiner hindsight. What sort of justification are you wanting? Combining A and B gets you a device with A and B are together. Where A and B have desireable properties, what further motivation could be articulated? I don’t want one. I want an allowance. If I can’t have that, then I want a rejection that meets the requirements and will convince my client that the Office has a point.
? I really do not know what you’re getting at in a post-TSM world. PLEASE tell me you understand your job better than that, Ben. For a change, let’s pretend that this is an educational blog geared towards helping patent practitioners improve their skills, and offer interpretations and suggestions, rather than snark and rhetorical questions. If B does something desirable, and bringing B into the orbit of A doesn’t destroy its ability to perform that desirable thing, then the A/B combination is obvious. That’s pretty clear law. You don’t need a special reason to want B, you don’t need to prefer B over C or D or E. Combining A and B *usually* gets you AB, and the motivation for adding B is that B is known to perform something of value, which is why B was invented in the first place. You are more than welcome to respond in any manner that you see fit, Abstract iDan. Then you may realize that the person that I am responding to will not see any such “help” that would be offered. The audience to that comment will learn more from the snark and rhetorical question than he would learn with a direct and non-snarky answer. Learning is accomplished in more than one manner. But to appease you (perhaps only slightly), I would draw attention to the exchange above between two regular examiner contributors (the same Ben here and Random) and point out that the phrase “Anticipation is the epitome of obviousness.” – while catchy – is not correct. This has to do with the fact that prior art needs more than being merely “prior” and that the considerations of 102 and 103 differ. For 102 and a single reference, merely “prior” is indeed enough. Just not so for 103. 103 is NOT just a collection of elements that IF those elements were in a single reference, then 102 would apply. De facto utility does NOT create 103 ready applicable prior art. De facto utility does NOT create instant motivation to combine. The non-snark and educational type comments that you seek have previously been supplied to Random and he has not learned something that is very basic (and very necessary to his job). Anticipation is the epitome of obviousness is a direct quote from a case. As usual, anon doesn’t know his law. Clearly 103 requires more than just a string of 102 references that “if they were in a single reference 102 would apply.” Anon fails to appreciate that the most commonly acceptable rationale is that combining things for their usual functionality is generally obvious. Pincites – without context – is NOT a showing that you understand the law, Random. That *is* a justification. Expectation of a known advantage is the strongest motivation for doing something. If a system claim to a toaster in a car is rejected over Reference A, a car, and Reference B, a toaster, the motivation for putting the toaster in the car is that the toaster makes toast. A car can’t make a toast, and a car with a toaster in it can make toast. You don’t have to come up with a special motivation as to why you’d want to make toast in your car. People like to eat toast, that’s why toasters exist, and that’s why you’d be motivated to put a toaster in your car. If you put a toaster in a car and that toaster (because its in a car rather than a kitchen) produces oranges, well then you have a non-obvious invention there. A car can’t make a toast, and a car with a toaster in it can make toast. You don’t have to come up with a special motivation as to why you’d want to make toast in your car. Please tell me you are joking. What you’ve described is circular reasoning. Almost every structure or step has a function — a purpose, which presumably is beneficial. Otherwise, why use it. If A has benefit X and B has benefit Y, you are arguing that it is prima facie obvious to combine A and B to have benefits X and Y. If that was all it took, then 99.9% of all inventions are obvious. I do not think that is correct. Even if the colocation of A + B was per se obvious (which is incorrect due to the possibility of unexpected results or secondary indicia), such a rule would render only a small fraction of inventions obvious. For any A+B invention, there are a multitude of ways of combining A+B which aren’t read on by A and B alone. In a sense, the colocation of A+B is a aleph one set while the possible inventions of a combination of A+B is an aleph two set. A+B being obvious is only problematic for the applicant claiming trivial colocations. What you’ve described is circular reasoning. No it’s not circular at all. It’s a straight line. Almost every structure or step has a function — a purpose, which presumably is beneficial. Thanks for admitting that. That’s why the straight line is so easy to draw. This isn’t difficult, by the way. you are arguing that it is prima facie obvious to combine A and B to have benefits X and Y [where X flows from A and Y flows from B]. If that was all it took, then 99.9% of all inventions are obvious. The percentage of new (undisclosed) combinations that most of us (those of us with imaginations, anyway) can articulate and which are obvious is ever greater than 99.9%. Just challenge yourself. Set a timer for five minutes and write down as many new combinations as you can. Let that be the goal: new. No other considerations. Just maximum amount of new combos. Weed out the useful ones. Then apply KSR to them. From MM: “The percentage of new (undisclosed) combinations that most of us (those of us with imaginations, anyway) can articulate and which are obvious is ever greater than 99.9%. OK, in this world of obviousness, what would it take to please you? If 1,000 people made their lists and it wasn’t on a single list? 1,000,000? Every person on earth? Can you list an invention, using 2 simple elements, that when combined meet your standard? What about the windshield wipers that every new car has (intermittent)? Was that good enough at the time? If you gave 10 people the 2 elements, windshield wipers and intermittent motors, wouldn’t most of them combine them in the ~only way there is to combine? Yet we drove cars for decades and nobody apparently thought of it. And it would take a patent to make such an idea worth investing in. Your thoughts, please. Malcolm tends to treat obviousness like he would treat ANY combination of novelty references. This is because of his background and biased belief that only NOVEL picture claim bio-chem like things are “really” deserving of patents. No its not. The reason you apply something is because you know what the results are. The reason you flip a light switch when the room is dark is because you believe (correctly) that it will cause the room to light up. When something behaves just like you would expect it to, that’s not invention, that’s just use of previous knowledge. If A has benefit X and B has benefit Y, you are arguing that it is prima facie obvious to combine A and B to have benefits X and Y. If that was all it took, then 99.9% of all inventions are obvious. It’s not that 99.9% of inventions are obvious, it’s that you’re confused about what constitutes invention. If I know my car will get me to work and once I am at work I know I can use a badge to enter the building and a key to unlock my door and a password to unlock my computer, I don’t become an inventor because I lack a particular motivation for using the car/badge/key/password combo, i’m just a guy who knows how to use four things in concert that function the same as they do independently. This isn’t me saying this, this is KSR and Anderson’s Black Rock. Your problem is with the Supreme Court. But really its with your concept of invention. That’s not how obviousness works. Every day you wake up and do different things. That does not make you an inventor daily. The fact that you don’t write down any particular method doesn’t make that method non-obvious. A method becomes non-obvious when it causes an increase in the sum total knowledge of the art. If I take 10 known things and put them in a room, that room doesn’t become a non-obvious system even if the 10 things wouldn’t be used together or have nothing to do with each other. The same is true if its 100 or 1000 or a million known things. Aggregating known things for their usual effects is non-inventive. But taking even two things (say a chemical compound A and a compound B) which combine to create something unexpected is non-obvious. You are incorrect Random. Perhaps it is a nuanced thing that you are missing. Perhaps you are trapped in a view of 103 merely being 102 in multiple references. I cannot tell for sure. What I can tell is that this is not the first time that you have expressed this incorrect view of something that you of all people (being an examiner) should have a better grasp of. But a toaster runs on 120V AC and the car does not provide 120V AC. Also a car pulls into gas stations where read hot heating elements would be dangerous. Also, there is the issue of distracted driving and burnt toast smoke making it difficult to see, not to mention scalding hot dripping butter. So why would it have been OBVIOUS to one of merely ordinary skill in the art to combine a car and a toaster and what would have motivated her to do so (other than reading my application)? That’s from the MPEP, by the way. Likely, no “definition” would be required here. Rather, this would be viewed by the Person Having Ordinary Skill In The Art to which the invention applies. How many toasters (here, for bread) are you aware of that do NOT run on typical current (i.e., 120V AC)? Instead of being your usual snide self, maybe – just maybe – take the time to understand the discussion under way. I agree with you that if a toaster could not be combined with the car (i.e. you live in a world where you couldn’t regulate the voltage) then the car/toaster combo would be inventive. But if you were smart the claim would not be to a car/toaster combo but to the structure of the voltage regulator. The fact that a toaster in a gas station would be dangerous doesn’t make it non-inventive. If you invent a mechanism by which the toaster could be less dangerous in a gas station scenario that mechanism is probably an invention, but the car/toaster is not. The fact that use is not perfect does not make the invention non-obvious. Spoiler – the use of the car by itself is dangerous. By your logic you could never combine the car with anything. The only question is if one is enabled to put the toaster into the car without relying upon some disclosure in the instant specification, and assuming one could, if the result is expected. Here, for me, is where most obviousness rejections go off the rails. Faced with a claim to a car with a toaster, rather than use any of a number of other rationales, examiners overwhelmingly resort to TSM and argue that the reason it would be obvious to modify the car according to the toaster is because (quoting from the toaster owner’s manual) it would yield the benefit of a one year warranty. It makes no sense, in a logic sort of way, to put a toaster in a car for a one year warranty. Car w/toaster being a frivolous example, but the logical disconnect that goes into so many TSM rejections is not. There are better tools in the kit yet they keep reaching for the same TSM cookie cutter and making awful cookies. You’ve still not described a “convincing” non-evidenced rationale for combination Les. Really? “Most” obviousness rejections use bizarre, illogical TSM rationales? Is that your sincere psrception or an exageration? Is that your sincere psrception or an exageration? There’s no difference between the two in Les’s world. What if I were to say “many?” Look, it happens a lot, but I’ve not really attempted to impose a statistical rigor to my experiences. The process steps are easy to spot, though. Find missing limitation in secondary reference, scan secondary reference for anything that smacks of a benefit, cite that as the motivation, collect points for another prima facie case. I have the same guidance on that point as you do, Supreme Court pronouncements. With that, it is far easier to identify missing or insufficient rationales. I can tell you that 99% of the time, 5 words typed after the pasted in introductory phrases are going to be insufficient. As you work on it, I would suggest contemplating what the word obvious means. I submit that it does not mean: If I find a difference between A and C, which I call B and then find an obscure piece of paper that mentions B- in a different context, then I can declare that A plus B would have been obvious because someone aware of A and B- would have wanted to make C because it makes better. examiners overwhelmingly resort to TSM and argue that the reason it would be obvious to modify the car according to the toaster is because (quoting from the toaster owner’s manual) it would yield the benefit of a one year warranty. That’s not what a TSM is. A TSM is the car including cup holders, which SUGGESTS (S) that people in cars like to carry food or eat/drink in the car. The example I gave (that the toaster makes toast) is the exemplary rationale of simple combination – that one of skill knew of the toaster, was enabled to incorporate it into the car, and the resulting incorporation produces expected results: Toast. That’s not off-the-rails, that’s basic motivation for doing something. I wonder if the irony of the “get what you measure” comment is recognized in how often the mistake of confusing what the job is with what the metric of the job is. Not sure if it’s irony, but I recognize it. That is the whole idea behind “you get what you measure.” The Office has performance metrics by which I am judged. When I am doing my job (separate from the metrics), I have limited time, energy, and abilities. So, to help me decide where to focus that time, energy, and abilities, the Office has developed metrics. I know that the metrics are not my job. But when push comes to shove, it is more important that I satisfy the metrics over other aspects of the job. Such is life. It is not unique to the Patent Office. You put your effort where you get the most return. Alas, while you recognize the difference, many examiners do not – and then get upset when “the job” results in p00r quality and condemnation from various sectors. “Such is life” is NOT a recipe for improving the work product. THAT is a recipe that drove America into the ground (while other nations realized that they needed to change the metrics to better align with what the job is. These are NOT new sentiments – Deming provided these AGES ago.